Canada's Most Adored and Respected Vocal Singer. The Number One Vocalist in North-America! A Dazzling beauty, an International Singing Diva, an absolute power to reckon with...Canada's Most Adored South-Asian Singer... 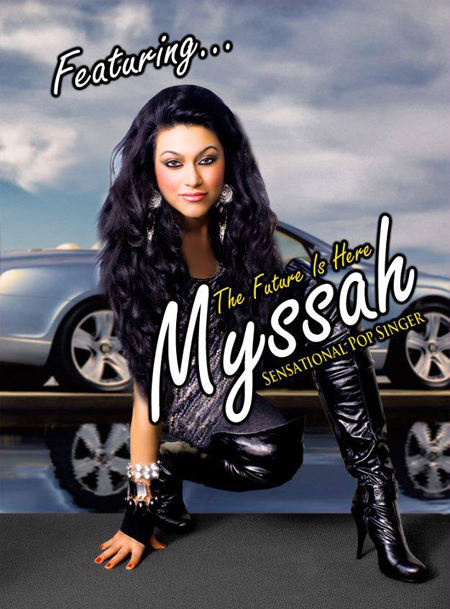 The Girl With The Golden Voice "MYSSAH"! Tall and Alluring, with a charismatic personality, the girl with the dimpled smile creates chaos wherever she goes... Myssah comes alive on stage with her mesmerizing performance, be it HOLLYWOOD or BOLLYWOODleaving a permanent impression on the minds of her ever increasing millions of fans all over the world! Her angelic vocal abilities and tremendous singing talent have truly earned her the title of the Nightingale of the EAST! Myssah boasts of having performed in countries ranging from Dominican Republic, The United States, United Arab Emirates, India, Pakistan, Middle East, United Kingdom and Malaysia. With repeat concert bookings on a weekly basis, she continues to expand her international fan-base!! Myssah has also had the honor of sharing the stage with some of the South-Asian industry’s most celebrated artists including.... UK Hearththrob's Jay Sean and Imran Khan (Amplifier), Kumar Sanu, RDB, Raghav, Apache Indian, Ali Zafar, Stereo Nation, Kashif & the Bilz, Manna Dey (Late), Atif Aslam, Pankaj Udhas and many more. In addition to that she was one of the very few Canadians who had the opportunity to walk the Green carpet at the IIFA Awards in Toronto along with known Bollywood Stars such as Shah Rukh Khan, Karan Johar, Bipasha Basu, Arbaaz Khan, Rishi Kapoor, Shilpa Shetty ... the list goes on and on.... There is no stopping for Myssah! On a more personal level, Myssah is an inspiration for youth around the South Asian Community due to her charisma, good looks, and love to aid and charity. All in all, this Canadian Desi artist is here to stay and is bringing the music industry a breath of fresh air with her sultry looks, dimpled smile and passion for music that will never end!! Currently, Myssah is working towards her Debut Album and has some great new songs on the way for her eagerly awaiting fans!